Did I mention two guys named Dan Jurgens & Lee Weeks??!? It's an interesting theory put forth, and one I'm sure Tom King and James Tynion IV will investigate in their Rebirth-fueled Batman and Detective Comics relaunches, respectively. 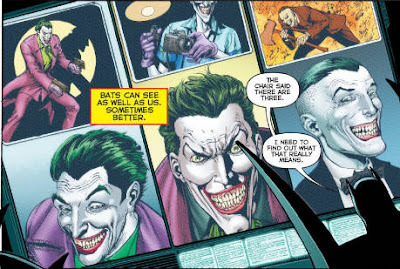 But really, if Batman hasn't been able to pick up on the fact--from variations in physical appearance and other flaws--that he's been fighting three separate Jokers over the years, what right does he have calling himself "The World's Greatest Detective"? Of course, that brings us to the image from the book's end, the one that everyone's talking about because ZOMG EVERYBODY'S GONNA FIGHT THE WATCHMEN (insert strings of useless emojis). Just about everyone's covered this topic earlier and better than me. 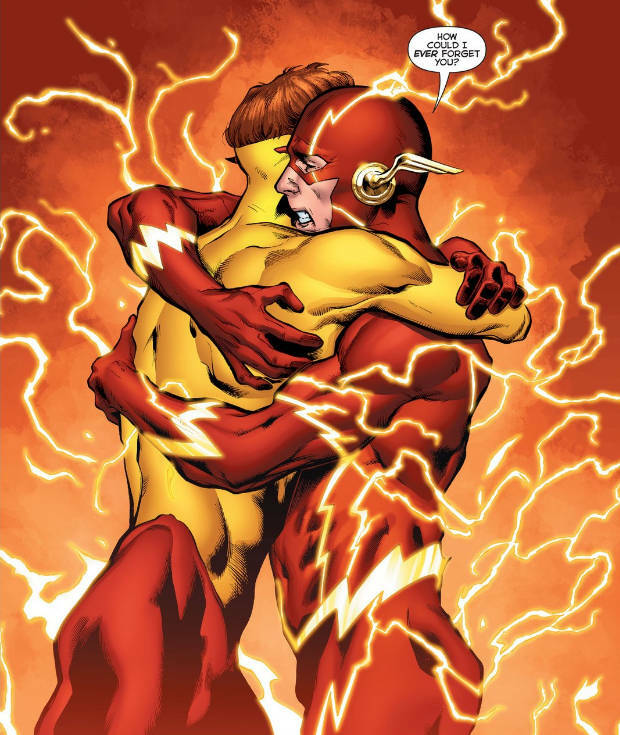 Johns unveils the secret of his Flashpoint event that led to DC's New 52 initiative and their re-ordering of continuity. Simply put, it wasn't the Flash who was (solely) responsible for futzing with time and causing this bold new era. It was Dr. Manhattan of the Watchmen, firmly grounding that out-of-continuity series in DCU lore. First, I'm pretty sure there's not going to really be any kind of direct conflict, at least not for a very long time; it kind of defeats the purpose for which Johns introduced this element. Second, the purpose in question is perhaps the most metafictional, anti-establishment message I've ever seen in a mainstream comic, because it amounts to a ballsy self-criticism of DC and its place in the industry since 1986. Taken pretty directly, in Rebirth Geoff Johns is stating that the grimdark of the modern comics era can be directly traced back to Alan Moore & Dave Gibbons' Watchmen and subsequent creators learning all the wrong lessons in their embrace of deconstructionism over what makes comics "fun." Did they really have any right imposing a formal structure of reality upon a medium and genre that so often lives outside it? 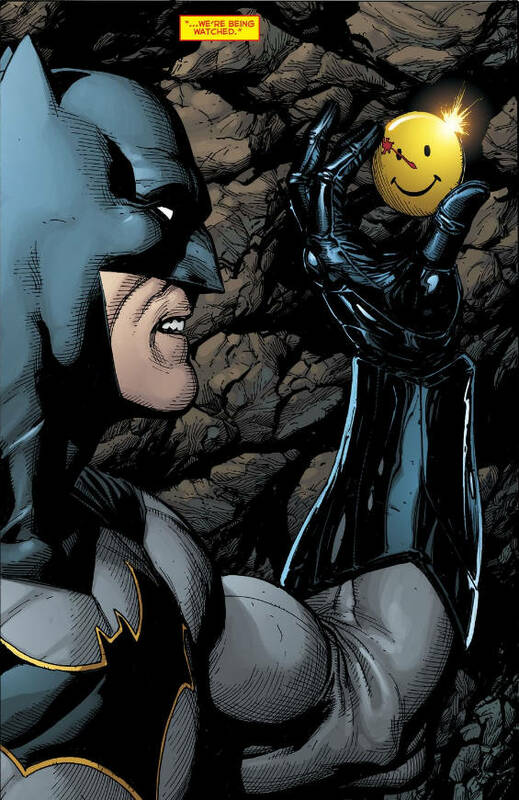 Further, it means that if there's any fighting to be done, it's DC's own metaphorical struggle, a refutation of Watchmen's lasting impact on the business 30 years on. It is interesting, though, how Batman is the one who actually discovers the first piece of the puzzle. Maybe doing so redeems him for his analogue's part? And speaking frankly, with hints of both Dr. Manhattan and the Comedian peppered throughout Rebirth, is it any wonder there are other characters lurking around the periphery? 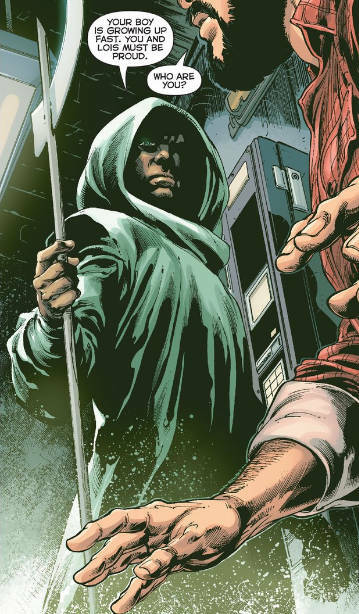 Certainly, Johns has been playing the long game in some capacity, for the "Mr. Oz" character he introduced in Superman #32 seems to be a disguised Ozymandias, the ultimate antagonist of Watchmen. It beggars the question, are we about to see Ozymandias and Dr. Manhattan battle on a new canvas? And what the heck does he mean when he says the Supermen aren't who they think they are? I love that DC has me theorizing and asking questions. Perhaps the most fun one is, "How much is this going to piss off Alan Moore?" By contrast, Marvel only has me asking two: "When's the next Marvel movie out?" and "When will the intolerable cruelty that is Totally Awesome Hulk be over?" 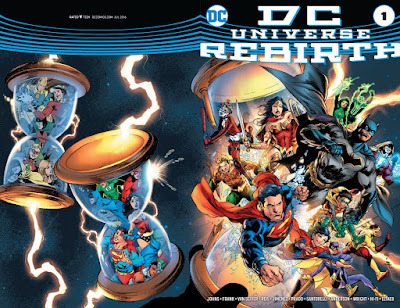 Post-Rebirth #1 I'm very comfortable in my decision to pre-order the first two months of the new stuff. I'll try my best to put some reviews up as I read them. Feel free to comment, too! Next: The best series of 2016 so far. Or the follies of BvS. I really haven't decided yet.